Simple Landing Copy Changes can Make a Big Difference. We work with them across platforms and tactics, and this means that we have the ability to run multiple tests. On one such test, we’re A/B/C/D testing taglines ONLY. Ad copy, layout, images, body text - everything else remains the same. This is the Challenger Page, the original we inherited and are improving via testing. The control here is the “hero” tagline, “FOOD IS BIG” - that’s our baseline. We’ll say that’s pH Neutral, neither good nor bad. Let’s label it “zero” and measure up or down from there. I’m not going to give away CIA’s conversion metrics - I’m not going to tell you if the original FOOD IS BIG page converts website visitors into inquiries at 2% or 5% or 20%, but I will share how these 3 “challenger” taglines compare to the original. And the results are striking. Challenger #2 - the one calling CIA the Harvard of Culinary Schools - converts almost 5% better. This means that for every 100 people that visit this website page, CIA will get five more inquiries. Human Intervention in Google Accounts. Search Engine Land brings news about a new Google Initiative. In brief, Google Ads reps are about to start making changes to advertiser accounts. Unsolicited changes. I guess this is an immediate direct threat to Yodle or Reach Local. To make more money: I’m sure they have data showing that actively managed campaigns, spend more than non-actively managed accounts. So I am not surprised that Google is intervening more in advertiser accounts. I am surprised that they are using humans to do this. Ad copy is now much more automated than I ever thought possible. Ad units - actual graphical ads - are being automated via Smart Shopping Campaigns that do perform well but are ugly. We, as an agency, are partially judged by what % of our clients use Google’s bidding automation tools. Google says outright that keyterm buys will eventually be sunset, and that we’ll all let Google’s algorithm decide where/what/when to run our ads, and in what units. A low-level google trainee out of Detroit - because that’s who will be making these changes - should not be acting unsupervised on your behalf. They can’t know what your goals are. Contextless changes - because a Google-only view that doesn’t know what’s going on with your Radio, Instagram and Facebook efforts, lacks context - should not be acting on your behalf. They can’t see the whole picture. Google has a habit of rotating reps off of accounts after 6 months - which means that you, a small business, will have to re-educate these remote, low-level employees, twice a year. We will be opting our clients out of these efforts. This is an example of a Dynamic advertising unit, created by Google Smart Shopping Campaigns. Clients - especially upscale clients - do not like these, because they don’t highlight the brand very well. We like these ads - and I’m sure Mack Weldon’s agency likes them plenty - because they simply out-perform. We are happy to have our third Google Summit in the books. We throw these events quarterly, and we strive to give real value to our attendees. This time, we were lucky to have Deepa Gandhi, COO and Co-founder of Dagne Dover, on stage for a fire-side chat. Thank you to all 100+ attendees for braving the 2 degree weather and coming out. I hope you enjoyed it as much as we did. 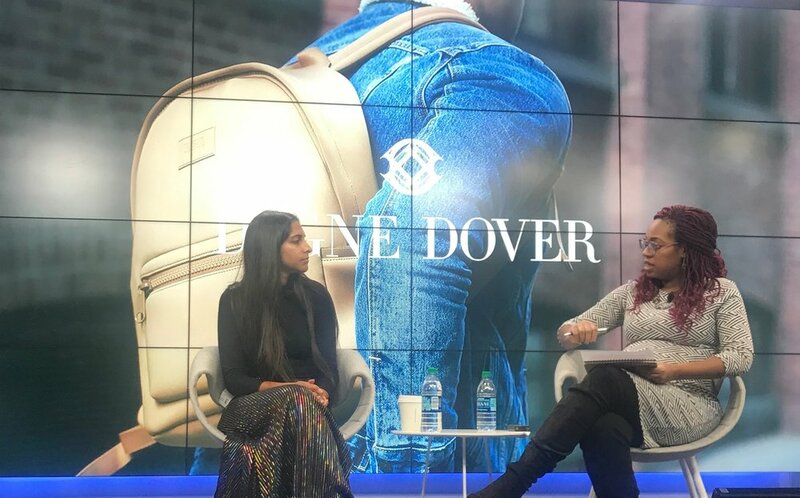 Deepa and Candace on Stage at Google on January 31st, during Dagne Dover’s fire-side chat. We are psyched to be handling a Direct to Consumer product for Walgreens Boots Alliance. The specific product line is Your Good Skin, and we could not be more psyched about it. dude. be nice, who strive to create what they call "Conscious Culture," is a blast to work with. Their mission is "to inspire people to treat themselves and others better" and part of the way they do that, is to partner with schools and other not-for-profits. Anyway, it's one thing to know that intellectually, and it's another to actually see one of their products "in the wild," as we did today on Cape Cod playing mini-golf. Good show! Monthly Trip to Chicago, #72, in the books. Mr. Padron strolling from TCS HQ, on past the campus. Changes to Gainful Employment laws affecting our business. The Education Department plans to eliminate regulations forcing for-profit colleges to prove that they provide gainful employment to the students they enroll. As someone who makes his living (in part) from advertising For-Profit Colleges, I have mixed feelings about this. The roll-back will most-likely result in my clients doing more advertising, which is good for me. And yes, I think personally that past Presidential Administrations over-regulated. Yes, I get that colleges are businesses, and businesses should operate as a free market. Yes I understand that nobody is making anybody enroll in these classes. But the loans people take out to attend these colleges, are backed by the tax-payer. In effect, the tax-paying public is subsidizing the few for-profit colleges that can compete at scale. So on that end, I think that rolling back these regulations is a bad idea. On the other hand, nobody every asked whether my Ivy League Art Degree was likely to result in me being gainfully employed. And in fact I drove a cab for a few years to make ends meet, because it was the best job I could find. Our job is to be an ally for our clients. We can be tactical/executional allies (Dear Mason, please update these 6,000 links by end of day) we can be Strategic allies (Hey Mason, we want to increase Back Friday sales by 3X over last year - let's align on a plan to show the board) and we can be both. I think we offer more use as strategic partners than as execution-based allies, but that's a discussion for another day. This Monster ad, above, fails on both levels*. Strategically it's bad because it will not bring them more money. This is a wasted effort in man-hours, media spend, and reporting time. I'd expect any client we did this for, to call me angrily ASAP. * FYI, we work with a competitor of Monster's. ** I drove a yellow cab here in NYC after college, and am in no way above driving for a living then or now. I'm just not a good demographic fit for this ad. We try, and do not always succeed, to have high-level Quarterly Business Reviews with our clients. Sometimes the client doesn't have time, or we delay it, but we really shouldn't. QBR's (Quarterly Business Reviews) can be super valuable for all. Today's QBR was with Van de Velde, who we've worked with for a while now. Adrian, Vivian, Caroline and I were joined by Candace Jordan (our Google Relationship Manager, who nicely left the Googleplex to see us in-office) while we talked over the Q2 challenges, and how these challenges inform Q4 strategy. The value here was in aligning growth expectations with historical trends, and I found it very helpful. If your agency isn't giving QBR's ask them to. Or if you don't find the QBR valuable, tell your agency what would be valuable, instead. I think it's key that everyone on a team have a common goal. When our company was smaller, and there were five of us in one room, there was much less need to formalize our mission. Now that we're bigger - and growing even bigger - we think it's important to formalize it. So, Mason Interactive's mission Statement is: Be an ally for our clients to grow their business. That's it. Simple. We succeed together, or not at all. Every new employee, from this day on, will be asked to memorize these pillars.